Pisco is a liquor (technically a brandy) fermented originating from Peru, and steadily growing in popularity worldwide. Pisco first made its name in the United States in the days of the California Gold Rush, brought by traders from Peru and immortalized by the likes of Mark Twain and Rudyard Kipling. In recent years it has begun to enjoy a reprise in the form of artisan cocktails. In Peru, however, pisco is much more. It is the national drink, a key export, and important enough to Peruvian culture to merit its own holiday each July. Production of pisco in Peru grew 34% between 2011 and 2015 (i), and is forecasted to be at >14 million liters by 2025 (ii). This colorless or slightly amber liquor is made from grapes developed and cultivated along the coasts of Peru, and varies in alcohol content from 38% to 48%. The production of Pisco is closely regulated by the National Institute for the Defense of Competition and the Protection of Intellectual Property (INDECOPI), which grants the official status of “Pisco” only when the liquor is produced in certain regions using specific varietals of grapes, and only under the provision that the traditional production practices have been used. With demand for Pisco growing worldwide, rapid analytical techniques are needed to ensure authenticity and deter attempts at counterfeiting. Pisco production in Peru, 2000-2014, reproduced with permission from ‘Consequential life cycle assessment of pisco production in the Ica Valley, Peru’, Ian Vázquez-Rowe, Life Cycle Management Conference, Luxembourg, 2017. Pisco may be distilled from a single aromatic grape varietal (Italia, Torontel, Albilla, Moscatel) or non-aromatic grape (Quebranta, Negra Criolla, Uvina), or it may be a mixture. These blends (called pisco acholado) make use of the more common Quebranta grape and are made from closely guarded recipes, much like the blended whiskies of Scotland. Each Pisco carries its own Protected Denomination of Origin (PDO) which lays claim to the grape(s) and purity of its composition. Since assessment of the authenticity of PDO claims must be performed by tasting experts, pisco is very prone to adulteration, particularly for the more expensive pure aromatics. Inexpensive blends may be passed off as pure, or a less prestigious grape may be substituted. No analytical or reference method has been established to validate the grape varietal, leaving a gap in efforts to deter counterfeiting. 1064 nm Raman spectra of three unique pisco samples made from Italia, Quebranta, and Torontel grapes, measured with the WP 1064L system). Spectra were then analyzed using pattern recognition by Soft Independent Modeling of Class Analogies (SIMCA) in an effort to classify the pisco samples, with a focus on the 990-1530 cm-1 spectral region for Raman. Each method – Raman and UV-VIS – was able to accurately discriminate aromatic from non-aromatic varieties, however, Raman provided the clearest discrimination between aromatics, non-aromatics, and mixtures by far. 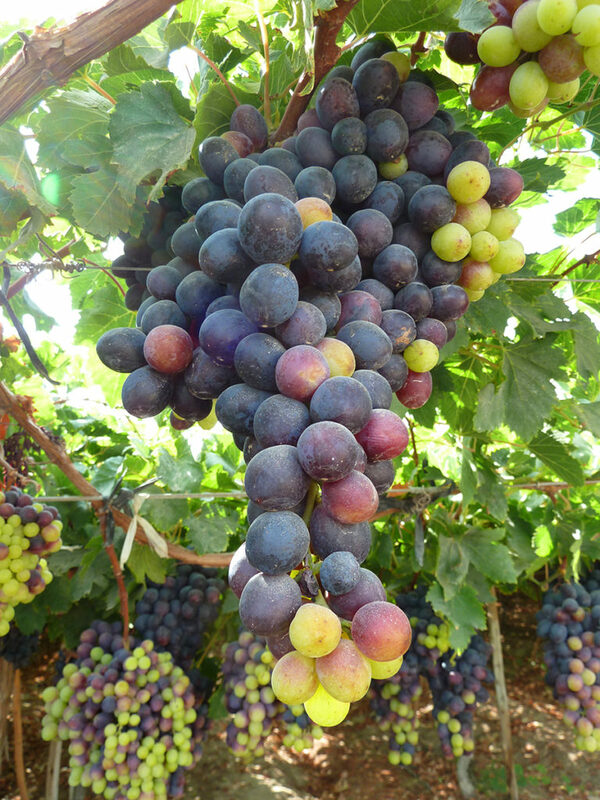 Raman was also the only method to provide clear discrimination between the two aromatic varietals, allowing pisco made from Torontel grapes to be identified versus Italia grapes. 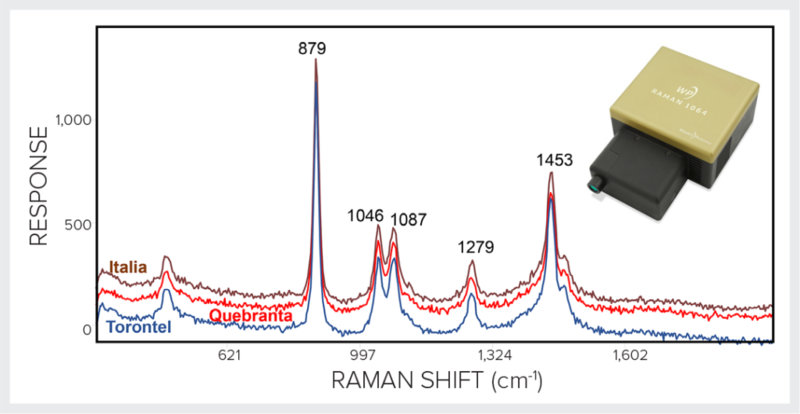 SIMCA score class projections for (a) Raman (WP 1064L) and (b) UV-VIS, (dual-beam benchtop system) showing the ability of each method to separate aromatic from non-aromatic grape varietals, and further discrimination of exact grape varietal by Raman spectroscopy. As a second phase, the study explored the ability of Raman spectroscopy to determine ethanol and methanol content in Pisco. The PDO requirements on pisco mandate 38-48% alcohol content, which could tempt less scrupulous producers or suppliers to supplement weaker products with methanol. While low levels of methanol are present naturally, and even allowed up to 150 ppm, higher levels can cause a variety of serious symptoms including vomiting, decreased consciousness, and loss of sight. Rapid, direct analytical measurement of both ethanol and methanol in the field would allow authorities to ensure both product authenticity and safety for consumers. A Partial Least Squares Regression (PLSR) model was developed to predict the ethanol and methanol content based on spectral differences within the sample set and levels measured using a reference GC method, and was found to have excellent correlation with the known contents. Correlation of the predicted alcohol content was very good with the measured values, showing excellent promise for prediction of ethanol content from 44 to 24 % and methanol from 0.5 % to not detectable using 1064 nm Raman spectroscopy. PLSR correlation plots for determination of (a) ethanol and (b) methanol in Pisco using a WP 1064L Raman system. Raman spectroscopy is a powerful tool for the authentication and analysis of foods and beverages, and its performance here for authenticating protected denomination of origin (PDO) of Pisco is no exception. By using the optimum excitation wavelength for this material (1064 nm), Raman spectroscopy was able to rapidly and effectively discriminate between grape varietals in Pisco at all levels: aromatic vs non-aromatic, and even the specific grape varietal (Italia vs Torontel). Furthermore, Raman spectroscopy demonstrated excellent predictive ability for the measurement of ethanol content for regulatory purposes, and of methanol content for protection of consumer safety. These capabilities combined make it a very promising tool for rapid authentication of pisco in the field for the protection of this unique spirit, as well as those who enjoy it. Many thanks to Dr. Luis Rodriguez-Saona and Ahmed Meneseovglu of The Ohio State University for sharing their research. View the full award-winning poster as presented by Ahmed Meneseovglu of The Ohio State University at IFT 2018, or learn more about the research in Dr. Luis Rodriguez-Saona’s group at OSU.